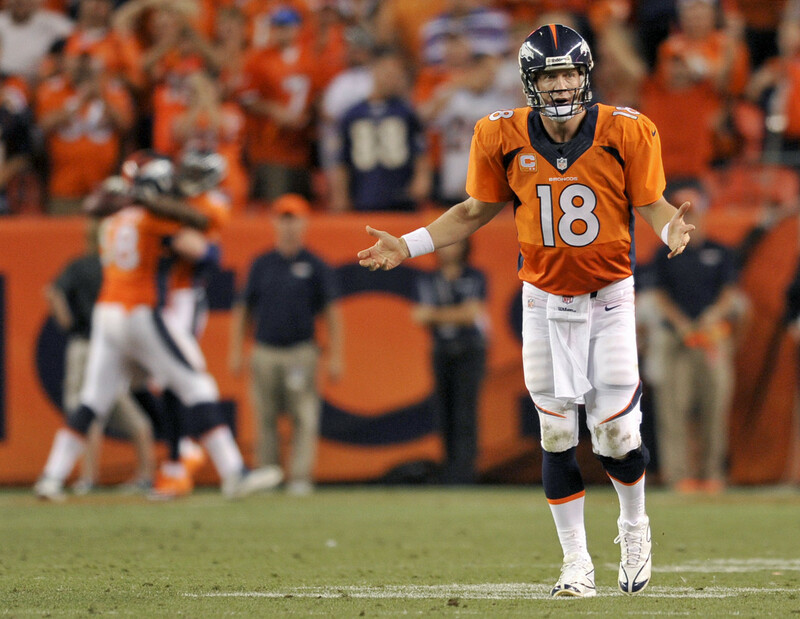 DENVER - Peyton Manning and the Broncos kicked off the 2013 NFL season in style with a 49-27 victory over the Baltimore Ravens. Manning tied an NFL record by throwing seven touchdowns as Denver showed why they are the favourites to win the Super Bowl this year. When the Ravens marched down the field in the first quarter and took the lead with a Joe Flacco touchdown pass to fullback Vontae Leach, it looked as though this game could turn out to be a close one. However, in the second quarter the tables started to turn in the Broncos favour as Chris Harris made an athletic interception of Flacco and Peyton Manning capitalised with a touchdown to tight end Julius Thomas on the very next play. After a Wes Welker muffed punt, Ray Rice skipped into the end zone for Ravens touchdown, but on the Broncos very next possession Manning looked Thomas' way again as they connected for another touchdown. After Justin Tucker field goal just before the half, Baltimore lead 17-14. In the second half, the Broncos turned on the style. In the third quarter, the much hyped Manning-to-Welker connection provided two touchdowns and Manning tossed another to Andre Caldwell. Manning hit Demaryius Thomas for his sixth touchdown pass at the beginning of the fourth quarter to make it 42-17, but he wasn't finished. With less than five minutes to go in the game, Manning threw a bubble screen out to Demaryius Thomas who took the ball 78 yards for a touchdown, making Manning the first quarterback to throw for 7 touchdowns in one game since Joe Kapp in 1969. Danny Trevathan joined DeSean Jackson in the 'bonehead play club' by dropping the ball before entering the end zone after picking off Joe Flacco. Will TE Julius Thomas be this year's Kevin Ogletree? Many people expected the Broncos defence to struggle without Von Miller and Champ Bailey, but this Denver team looked dominant in all phases of the game. Despite a very poor start for the Ravens, expect them to improve over the course of the season as they adapt to life without Ray Lewis and Ed Reed.